Jeff Zentner is the author of The Serpent King, a New York Times Notable Book, winner of the William C. Morris Award, and recipient of many other accolades; and Goodbye Days, named an ALA-YALSA Top Ten Best Fiction for Young Adults title. Jeff was a Publishers Weekly Flying Start and an Indies Introduce pick. Before becoming a writer, he was a musician who recorded with Iggy Pop, Nick Cave, and Debbie Harry. 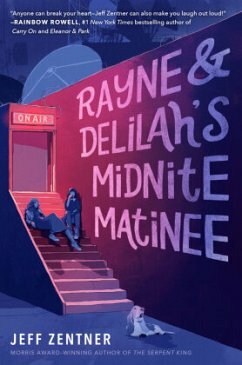 Rayne & Delilah's Midnite Matinee is his ode to best friends who make things together. He lives in Nashville with his wife and son. You can follow him on Facebook, Twitter, and Instagram, or visit him at jeffzentnerbooks.com.